While stating that there is a threat to wildlife in the Yala National Park due to the action of some people, Wildlife Minister Ravindra Samaraweera yesterday said steps would be taken to minimize such threats which would result in decreasing safari jeeps entering the park daily. Minister Samaraweera made this statement after a photograph, which showed a number of safari jeeps with tourists surrounding a sloth bear in the park, went viral on social media. He told the Daily Mirror that this was an issue which should be taken into consideration and accordingly immediate steps would be taken with this regard by the ministry in order to safeguard the wildlife. “People who are visiting Yala tend to engage in such activities and when they see an animal, all the safari jeeps surround it in order to have a closer look. The steps taken to control this condition would be informed in the near future and it might result in reducing the number of safari jeeps entering the park daily,” he said. However, Wildlife Conservation Department said such incidents could be dangerous to wildlife if some sort of accident took place. Department’s Director General M.G.C. 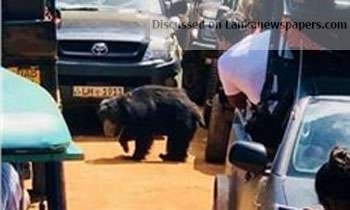 Sooriyabandara told the Daily Mirror that the wildlife in these tourists’ zones including Yala were habituated to humans and their activities and added that it was the reason this bear in the picture was walking among the safari jeeps calmly without any fear. Meanwhile, senior environmental Jagath Gunawardena told the Daily Mirror that this incident was a result of irregular vehicle moments. He said the wildlife should not be distressed due to safari jeeps and added that Wildlife Conservation Department should tackle these issues. “I have observed that many animals were being run over and killed on the roads in Yala. Accordingly, this incident is obviously a threat to wildlife,” he said.